The scientific discipline of underwater acoustics has been undergoing a long transition from an observation phase to a phase of understanding and prediction. This transition has not always been smooth - direct observations have traditionally been limited, the resulting prediction tools (models) were not always perfected and much refinement remains to be completed. Experimental measurements in the physical sciences are generally expensive due to instrumentation and facility-operation costs. In the case of oceanographic and underwater acoustic data collection, this is particularly true because of the high costs of platform operation (ships, aircraft, submarines). 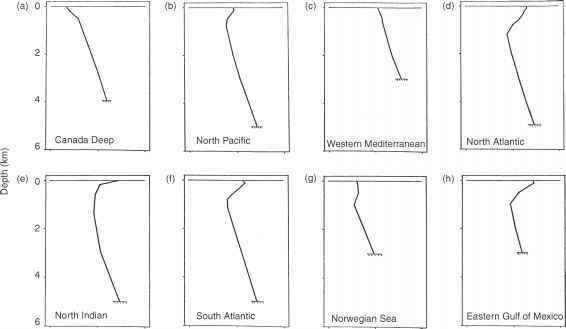 Acoustic datasets obtained at sea are limited by their inherent spatial, temporal and spectral dimensions. Consequently, in the field of underwater acoustics, much use is made of what field measurements already exist. Notable large-scale field programs that have been conducted successfully in the past include AMOS (Acoustic, Meteorological and Oceanographic Survey) and LRAPP (Long Range Acoustic Propagation Project). More recent examples include ATOC (Acoustic Thermometry of Ocean Climate) and other basin-scale tomographic experiments. Modeling has been used extensively to advance scientific understanding without expending scarce resources on additional field observations. The balance between observations and modeling, however, is very delicate. Experimenters agree that modeling may help to build intuition or refine calculations, but they argue further that only field observations give rise to genuine discovery. Accordingly, many researchers find mathematical models most useful once the available observations have been analyzed on the basis of simple physical models. The relationship between experimentation and modeling (in the furtherance of understanding and prediction) is depicted schematically in Figure 1.2. Here, physical models form the basis for numerical models while experimental observations form the basis for empirical models. 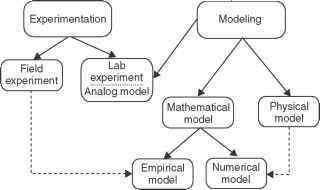 Moreover, analog modeling is represented as a form of laboratory (versus field) experimentation. Figure 1.2 Schematic relationship between experimentation and modeling. Scientists are becoming more aware of the connection between physical processes and computation, and many now find it useful to view the world in computational terms. Consequently, computer simulation is sometimes viewed as a third form of science, midway between theory and experiment. Furthermore, understanding can be enhanced through the use of advanced computer graphics to convert large volumes of data into vivid and comprehensible patterns. Because of national security concerns, some existing datasets are limited in accessibility. Also, because of the wide range of acoustic frequencies, ocean areas and geometries of interest to researchers, it is virtually impossible to accommodate all potential observational requirements within normal fiscal constraints. To make matters worse, acoustic data are sometimes collected at sea without the supporting oceanographic data. Thus, models cannot always replicate the observed acoustic results because they lack the necessary input parameters for initialization. This situation has been improving with the advent of modern, multidisciplinary research that necessitates the inclusion of oceanographers in the planning and execution of complex field experiments. Satellites, together with other remote-sensing techniques, provide a useful adjunct to the prediction of underwater acoustic conditions. Specifically, many dynamic features of the ocean affect the behavior of sound in the sea. Knowledge of the location and size of such dynamic features can improve the prediction of sonar performance. Although satellite-borne sensors detect only surface (or near-surface) features of the ocean, such as thermal contrast, color or surface roughness, these "surface expressions" can generally be associated with dynamic oceanographic features below the surface, particularly when comprehensive climatological databases already exist with which to establish such associations. Thus, for example, satellite imagery can be used to provide timely and accurate position information on variable ocean features such as fronts and eddies - features that are known to have a significant impact on the propagation of acoustic signals in the sea. Tactical oceanographic data collection in support of naval operations has been augmented by drifting buoys, which use satellite relays to transmit data to mobile or stationary receiving stations, and by autonomous underwater vehicles (AUVs) to access remote ocean areas such as shallow-water and under-ice regions (Brutzman etal., 1992; Dantzler etal., 1993; Selsor, 1993; Etter, 2001b). The problem of operational sonar prediction embraces many disciplines, one of which is modeling. Such modern operational applications involve not only underwater acoustic models but also oceanographic models (Etter, 1989). The coupling of these two types of models provides a valuable set of prediction tools to naval force commanders by enabling them to respond to the changing environmental conditions that affect their sonar performance. The remote-sensing data now available to naval forces afloat can be used in conjunction with oceanographic models to accurately forecast the locations and characteristics of dynamic ocean features (Robinson, 1992). This information can then be input to the appropriate acoustic models to assess the resultant impact on sonar performance. These sonar systems can then be optimized for performance in each region of operation at any given time of the year. Advances in sonar technologies have rendered modern sonar systems useful for in situ measurements of the ambient marine environment. For example, through-the-sensor measurements of the ocean impulse response (Smith, 1997) have enabled modern sonars to perform collateral functions as "tactical environmental processors."